Mix and pat crust ingredients into an 8 or 9-inch springform pan, covering the bottom and sides part way up. Let cream cheese soften in large bowl. Blend in 1 cup sugar and salt, beat until fluffy. Add eggs one at a time, blending well after each egg. Beat in Midori. Pour into crumb crust. Bake at 350 degrees F (180 C) for 50 minutes or until firm in center. Let stand 15 minutes. Reset oven to 450 degrees F (230 C). Combine sour cream, sugar and Midori for topping. Pour onto cake. Bake another 10 minutes. Bring Midori and gelatin to boil and cool until syrupy. 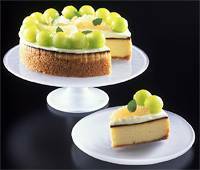 Place melon balls on cake and spoon glaze over. Refrigerate and serve.